Cotton Kiwi: A Very Merry Un-Birthday to you! It's birthday time again. 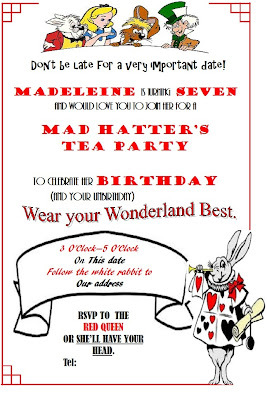 Maddy is turning 7 in a couple of weeks and has asked for an Alice in Wonderland party. Oh ok.... so I suggested that she had an Alice in Wonderland party. It seems like the perfect theme for a seven year old's birthday party (and I know how much fun I can have with this theme). And lets face it, the alternative was a Littlest Pet Shop party and how far can you go with that theme with what you have lying around the house?! I've finished the invites and I'm really quite pleased with them. My new computer has Microsoft Publisher on it and it's just so easy to use. The images are free clipart. Just google Free Alice in Wonderland clipart and you will find loads. I'm going to try to keep the party as simple as possible as I've got quite a bit on with markets etc at the moment but a tea party is going to be really easy to do. I'll update you with more of the plans as they happen. If you want to use the invitation for your own party, feel free. I'll pop a blank version of it in the party section of the blog. enjoy the preparations, so much fun. did you ask me something about the cake & I forgot to answer?? please let me know...I have been a tad forgetful. Sarah, even if you "keep it simple" knowing you and seeing what you did with the last party, it will be amazing, gorgeous and fabulous!